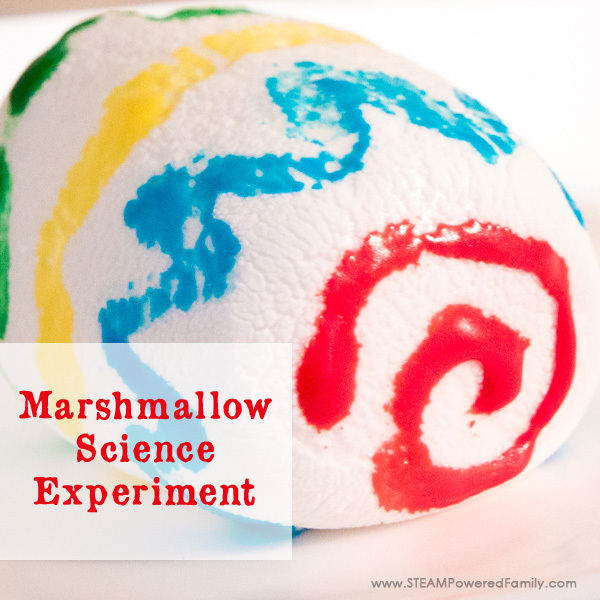 Want a sure fire way to get kids really excited about science? Bring the science into the kitchen! Especially if you make it a candy science session. 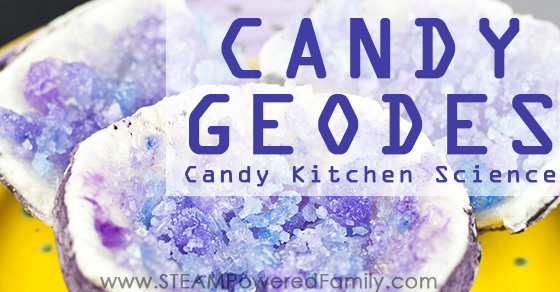 Kids love learning with candy and this Candy Geode Kitchen Science Activity is sure to be a big hit with your older kids. Once again I asked my mom to help out with this candy science experiment. She is the queen of making sweets and delicious concoctions in the kitchen. And she loves the idea of getting her grandsons excited about learning by teaching them valuable kitchen skills. Plus, she has this amazing knack for knowing just what needs adjusting to make these, sometimes complicated, recipes work and ensure they function as a great learning opportunity. So with that, I’m letting her take the wheel and send us into the world of making candy geodes! 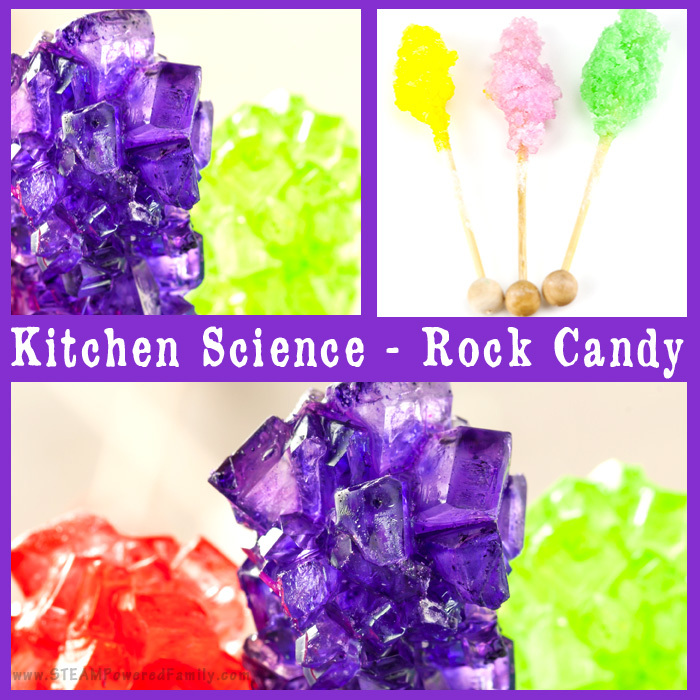 This Candy Geode Kitchen Science Activity involves working with sugars at high heat which can cause severe burns and injury. As such, it requires extensive adult supervision and is recommended for students 12 and up. Please use common sense. In nature geodes are created in the hollow areas of soil such as animal burrows or tree roots. They are also formed in the bubbles in volcanic rock. Over time, dissolved minerals seep into a hollow area and harden into an outer shell. Crystals form inside the hollow making a geode. Cracking open the seemingly mundane shell of a geode to discover the beautiful crystals within is an experience like no other. Except maybe eating this candy version of a geode. 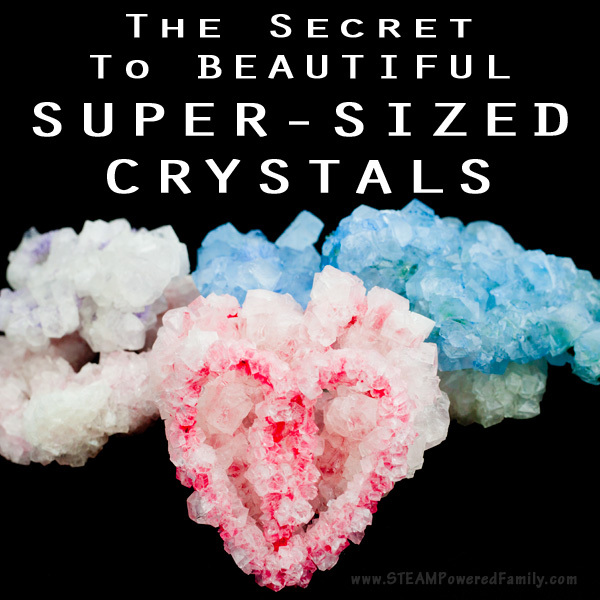 It is surprisingly tasty and kids love to get involved in the science behind the creation of these beautiful crystals. We will make the shell out of gum paste and then using supersaturated syrup, grow our crystals from sucrose. The resulting candy looks just like a geode from the ground but is delicious and edible. 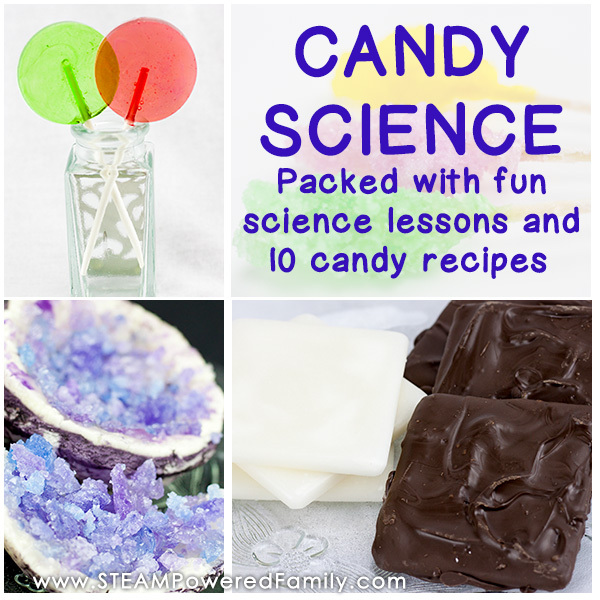 For more information on the science behind candy making, make sure you read our main article on Candy Science. There we delve into the chemistry and lots of interesting science around the creation of sweet treats. For the shell, you will need gum paste and a small dish to form the shell in. 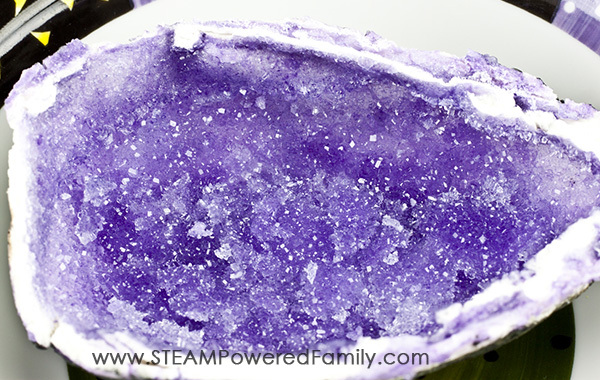 Depending on the size and shape you wish for your final geode, there are lots of candy and cake molds that can work. You can buy gum paste ready to use or make it using this very simple recipe. Icing colouring and flavouring if desired. Put the marshmallows into a large microwave dish. Run for cycles of 15 seconds until melted. Stir between cycles. It takes about 1.20 minutes but be careful because its very hot and will burn if you get it on your skin. When melted stir in 1 ½ cups of icing sugar. Mix until you have a smooth paste and its cool enough to work with. Coat your hands with a film of Crisco and turn out onto a sugar coated board and start kneading. When you have a soft pliable sugar dough, incorporate the tylose by sprinkling it over the top of the dough and kneading until fully incorporated. Whether you bought gum paste or made your own, the next steps are the same. Split the gum paste into two sections. Add flavouring if desired (peppermint was amazing!) to both portions, then set one portion to the side. To the other section add icing colouring. I used black icing colouring to produce the stone colouring of the outside shell. Don’t over work the colour. You want to produced a realistic stone colouring which will be speckled and veined. Leave the second portion white. Let the whole lot rest for at least 2 hours. Roll out a small amount of the white gum paste. Roll out a small amount of the coloured gum paste. Lightly wet the coloured gum paste to help it adhere to the white paste. Now roll the two pieces out to the size needed for your mold. Tip: Line the mold with tinfoil to make removal easier. Press the gum paste – stone coloured side out into your mold and let harden for a day (more if you live in a humid area) in a warm dry area. To make the crystals we need to create a super saturated solution. 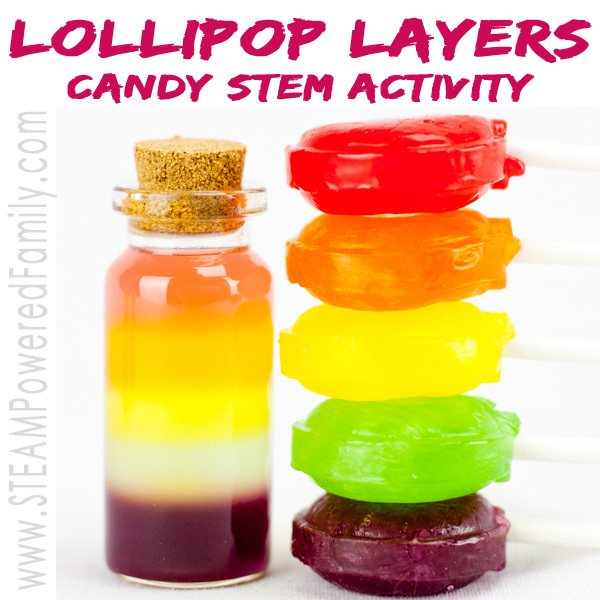 You will need a stove top for this portion of our kitchen science activity. In a pot combine ½ cup of water with 2 cups of granulated sugar. Remove from the heat and add coloring and flavor. I used violet food coloring (red and blue mixed) and peppermint flavoring. Use two large sheets of tinfoil. Set your gum paste shell (still in the mold) on the tinfoil. Allow to the syrup cool a bit and then pour into your gum paste shell. Carefully wrap the foil around the shell and fold it so that the gum paste shell and the supersaturated sucrose is completely enclosed. Place in a warm area and do not disturb. I used my over the stove microwave – this is warm and out of the way so that I could leave the geode to develop. It took about 5 days to start developing the crystals in my kitchen. When the crystals are formed, unwrap and turn the geode upside down to drain away the excess sucrose syrup. 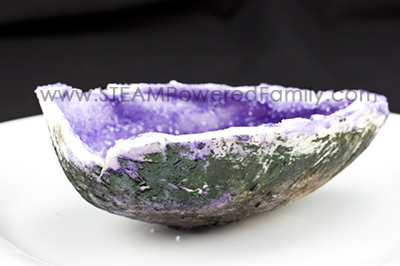 Carefully pull off the foil lined mold and leave the geode to dry for a couple days. 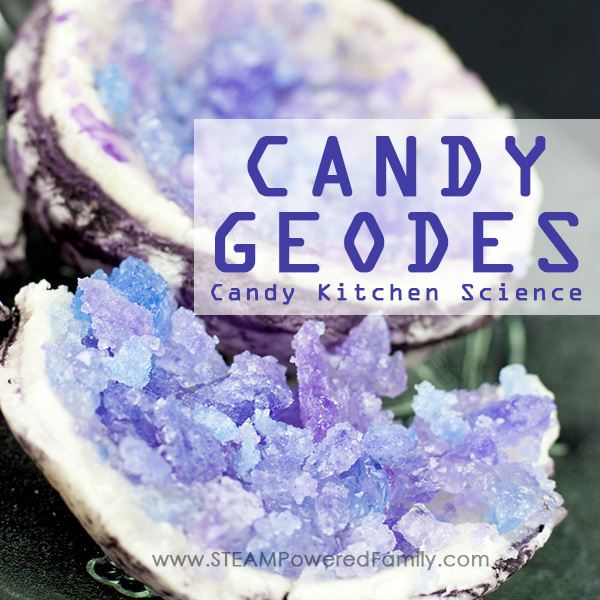 Now you will have a beautiful edible geode to show to your friends! It tastes great too! Thanks to you and your mother for candy recipes. Gave grandsons real geodoes and thirighly unimpressed. Going to try your recipe am sure they’ll be more enthusiastic!